"For the IRS toll-free lines, there have been long customer wait times, resulting in abandoned calls, and customers redialing," states the inspector general. "Despite other available options most taxpayers continue to use the telephone as the primary method to contact the IRS." "We reported that taxpayers were still experiencing long delays in resolving their tax accounts and that the IRS continues to make errors on the victims’ tax accounts," the inspector general stated. "The impact of identify theft on tax administration is significantly greater than the amount the IRS detects and prevents." "The IRS will work both to improve taxpayer service delivered through traditional channels and continue modernizing the services we offer in order to help transform the taxpayer experience," he said in testimony before the Senate on Tuesday. "Taken together, these improvements will ultimately allow taxpayers to resolve more issues online, leaving our employees more time to support the transactions that are best completed by phone or in person." Update Friday, March 11, 7:00 P.M.: According to a spokesperson from the IRS, there were 8.8 million callers looking for live assistance, and of that number, 6.4 million reached a human assistant on the telephone. The IRS says this results in a level of service of 72.8 percent. When asked what was the source for the number of those looking for live assistance, the spokesman responded that the IRS was the source. There were 40.5 million calls to the IRS’s customer assistance lines. "About 15 million of these calls come in after hours when assistors were not available," the spokesperson said. "About 5 million of these callers, nevertheless, receive assistance through an automated system that has self-directed interactive messages that addresses many common questions. For those who call in during business hours, about 9.7 million receive assistance through the automated message system." 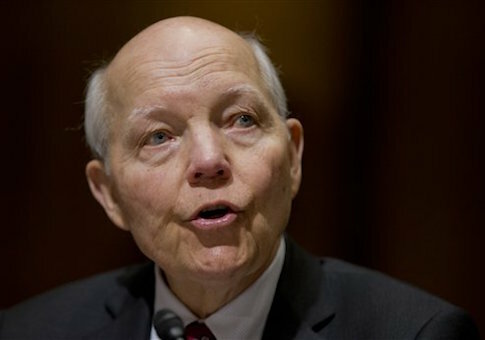 "The IRS has taken great strides to improve telephone service this filing season," the spokesman said. "Our level of service for the current tax season is above 70 percent for this filing season – meaning that seven out of 10 taxpayers seeking a live telephone assistor actually reach one. While this is still not as ideal as we would like it to be, this is a vast improvement over a year ago when the level of service was routinely under 50 percent during filing season and about 38 percent for Fiscal Year 2016." This entry was posted in Issues and tagged IRS, Taxes. Bookmark the permalink.